I totally caved and got a pair of wedge sneakers. At first I abhorred them, but they have slowly grown on me as I’ve seen other fashion bloggers style them and I thought “hey, I can make those work!” Also, I have never owned a pair of Uggs, Crocs or Vibram 5 Fingers, so I think I’m allowed at least one crazy shoe purchase! 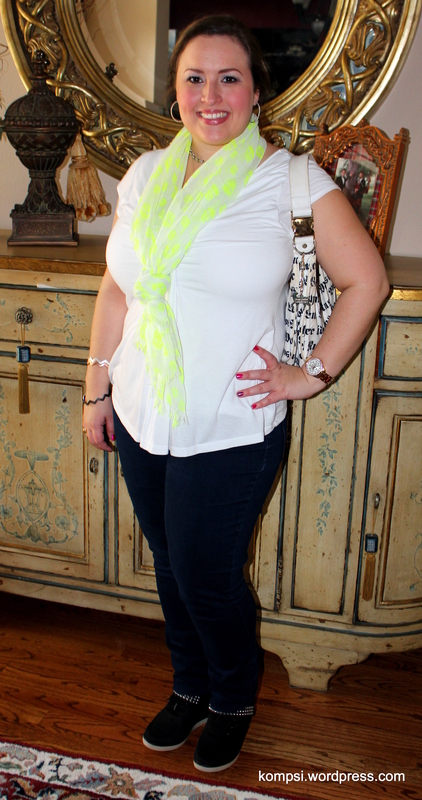 I LOVE the scarf in this outfit, it’s my favorite shade of neon and although it’s hard to see, it’s printed with little skulls. It’s an affordable knock-off of Alexander McQueen! Shirt, unknown brand (old); scarf, Target; jeans, New York & Co. (old); wedge sneakers, Target; handbag, Gwen Stefani for Le Sport Sac (old); bangles & earrings, Sam Moon; watch, Versona. Bonus picture! My pups wanted to get in on the photo shoot, Stitchie is on the left and Lilo is on the right. They are so fun! 2.) that picture of you and the pups is adooorable! Love your scarf!!! And your puppies are soooo cute!